California Government Code Sections 7596-7598 Smoking is prohibited: In an outdoor area within 20 feet of a main exit, entrance, operable window, or inside of a public building owned and occupied, or leased and occupied, by the state, a county, a city, a city and county, or a California community college district. As people enjoy the health benefits of smoke free air indoors, it is only natural to want to enjoy those same benefits in outdoor areas, especially those where people gather or work and have high levels of exposure. In response to increased public demand and new scientific information on the health hazards in close-quarter outdoor areas, many communities with smoke free indoor air laws have expanded, or are considering expanding, smoke free protections to some outdoor public places. 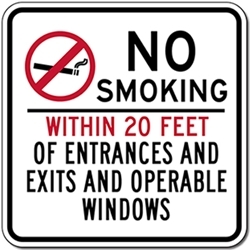 Using our No Smoking Within 20 Feet-Entrances-Exits-Operable Windows Sign protects these areas.